Helen Hurley paused at the doors of St. Vibiana’s Cathedral. In pain, she shoved her left wrist inside her dress so that it wouldn’t show as she went in to pray during Mass. But the pain was too great and she fled the cathedral for her room at the Ramona lodging house on South Spring Street. 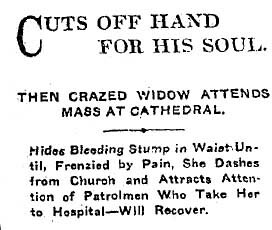 While struggling with her at the rooming house, police officers discovered that she had cut off her left hand with a butcher knife. They took her to the Receiving Hospital and after treatment she was taken to County Hospital. For the last year, Hurley had worked as a cook at several Los Angeles restaurants. Her husband died, leaving her broke and grieving. “It is said that for days at a time she would lie in her room, under the influence of liquor, and brood,” The Times said. The night before she was taken into custody, lodgers heard her walking around her room, moaning. Hospital officials were keeping close watch on Hurley and said that if she didn’t improve she would be sent to an insane asylum.